Providing Cowley College students with a fun, stress-free time to let their minds rest during finals week, the school held its annual Late Night Breakfast Wednesday in the McAtee Dining Center. Great Western Dining was gracious enough to allow Cowley College staff and faculty an opportunity to come in and serve the students during the Late Night Breakfast. 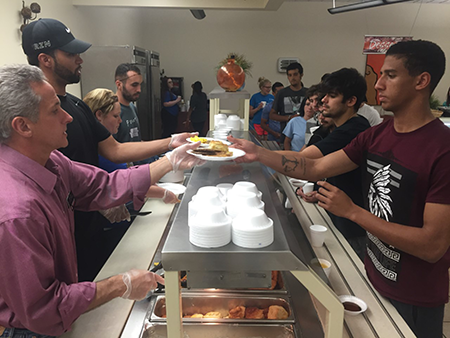 Each semester during finals week, Great Western Dining prepares a breakfast meal that is served by Cowley’s staff and faculty during the late night hours. The late meal allows students a break from studying…or just some additional ‘brain food’ to help get them through the study-binge.